We offer a range of services to fit your needs. Tired of your cookie cutting home? Kitchen and bath remodels are two immediate ways to increase the value of your home. Get the most out of existing space, upgrade current fixtures or expand and build the kitchen or bath of your dreams. We are ready to help you plan, install and complete yor remodel today! Let your home reflect your personal stlye. The average household's leaks can account for more than 10,000 gallons of water wasted every year, or the amount of water needed to wash 270 loads of laundry. The water also causes additional damage to surrounding areas which will add up to BIG cost unless repaired quickly. Save money now by repairing costly leaks. In an average home, heating water accounts for 15% of the total household energy use. Nearly 30% of all indoor water use is hot water. Huge savings can be made simple with the use of tankless systems. Only heat what you need when you need it. Cutting costs signifigantly. These tubs are designed for a person to enjoy all the benefits of hot water hydrotherapy with ease of use. The design is elegant and functional. Walk-in tubs are actually higher than conventional tubs. However, there is a door on the side of the tub that makes it easy for a person to get in and out. The door closes and seals watertight. The tubs have a built in seating area that makes it as easy as sitting down and rising from a hard-backed chair. Regular plumbing services are a crucial part of maintaining the property value and usability of your residential or business space. Professional plumbing companies will maintain and repair pipes, fixtures, and sewage systems. It is important for businesses and residential spaces to refer to a professional plumbing company for regular drain cleaning services. Does your water taste funny? Have an odd odor or color? It may be due to the deterioration of your pipes. Older homes sometimes have more charm, more space and often built on bigger lots of land. Unfortunatly the older the home the higher chance of debris and grease build-up, or worse yet pipe deterioration. CPVC pipe’s non-corrosive nature and resistance to chemical attack also renders it non-reactive with drinking water. CPVC pressure pipes do not adversely alter water quality. 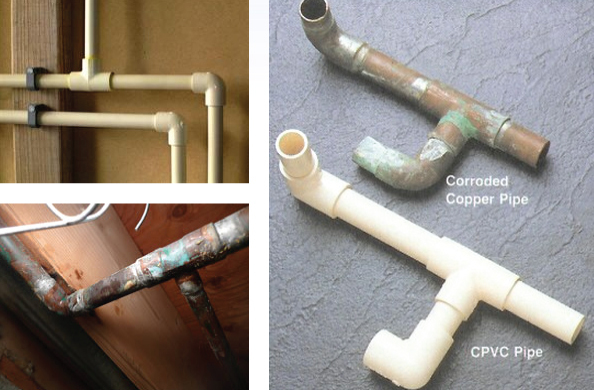 There are no corrosion byproducts with CPVC pipe and increases the resale value of your home.The CPVC system is four times quieter than copper plumbing systems, reducing not only the sound of running water, but also the pounding noise of the water hammer. Its thermoplastic properties provide excellent insulation to virtually eliminate sweating and condensation. It keeps hot water hotter and cold water colder than copper plumbing. There is minimal energy loss through pipe walls, saving money on heating and cooling.